We all talk to people each day. We talk to people in the coffee shop, on the subway and all throughout our workday. But do we listen? How much are we paying attention to the thoughts and ideas of the other person? These days it’s much more difficult than it was 20 or 30 years ago. People have cell phones in their hands to fidget with during conversations. We all have internal thoughts that are racing to get out into the world. 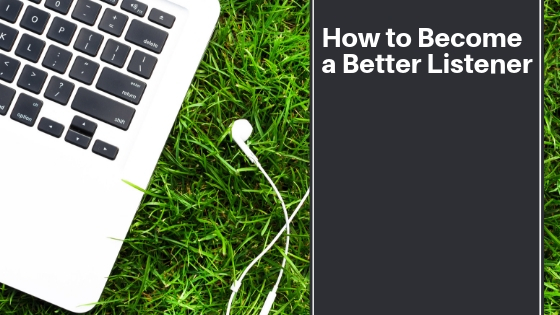 Listening is a lost art, but here’s how you can start to do it better. Put away all distractions. Turn your cell phone or face down and push it away. Close your computer and move it away from you. Turn off any music or the television. Now the listener has your full, undivided attention. Putting away these distractions lets the listener know that they are important. Have you had a conversation with someone that is in their phone the entire time? It’s not uncommon anymore, but the person on the phone is non-verbally saying this: You don’t matter. These non-verbal cues speak volumes. Show the speaker that you (the listener) acknowledge their presence and are prepared to listen to everything they have to say. Be on the look out, too, for any non-verbal clues. This may be body language or expressions. It may be what someone is saying without directly saying it. Listen intently and with empathy. Is one hand sitting below their chin? They may be bored. Arms closed tight means that they are closed to new information or ideas, while sitting relaxed with their arms open means the opposite. What is their tone of voice? Are they happy, defensive, anxious or eager? Cue your ears into what they have to say and how they are saying it. This is going to make a big difference in you perceive the message. Next, be sure to ask open-ended questions. These are questions that don’t require a yes or no. Instead, they go more in depth. They have to think about their answer and process a response. These types of questions allow the speaker to be more intellectual and insightful. They may elaborate on their answer and give you more details than you expected. This is because the speaker feels comfortable with you; they feel as if they are important to you. Therefore, they feel as if they can have a casual conversation without worry. On the contrary, a closed-ended question is a yes or no question. These are quick answers and they don’t require much thought. Moreover, don’t interrupt or change the subject. This reinstates the point earlier about distractions. Interruptions are a type of distraction. They make the speaker lose their train of thought. Suddenly what they were about to say is gone. If this interruption was intended then it non-verbally shows that the speaker lacks importance to the listener. The listener may want to take over the conversation, but don’t speak until the speaker has finished their complete thought. If it’s not intentional, then the speaker is more than likely going to be understanding about it. Finally, think before you respond to the speaker. At the same time, keep your mind clear while they are speaking. If you are thinking of your response while they are still talking, then how is it possible to be listening? You can’t hear their words over the jumbling thoughts in your own mind. Try to remain truly focused on the conversation. If you do this, then you’re not going to have time to think of responses. They are going to come to you when the time is right. You will always know what to say.